Japan will nationalize 280 islands within its exclusive economic zone, according to a senior official. Japan announced plans on Wednesday to establish administrative state control over 280 uninhabited islands in its exclusive economic zone (EEZ). The South China Morning Post reports that Ichita Yamamoto, Japan’s minister for oceanic policies and territorial issues, said that Japan will register the remote islands as state property to enhance their management.” Yamamoto allegedly made no reference to maritime security or territorial integrity. 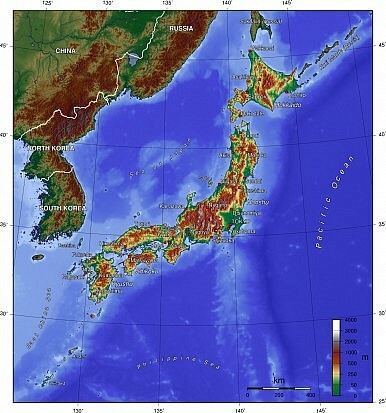 According to Bloomberg, “the islands are among about 500 that define the borders of Japan’s territorial waters according to a survey being conducted by the government.” All islands lay within Japan’s exclusive economic zone – a seazone which grants a state special rights over exploration and exploitation of marine resources, prescribed by the United Nations Convention on the Law of the Sea. The move coincided with Japan’s launch of the administrative office of its National Security Council which intends to consolidate Japan’s various security agencies and its Self-Defense Forces under the Prime Minister’s office. Although there is no reason to believe that the 280 islands under question include any disputed islands, the move nonetheless will stoke fears in China and South Korea about Japan pursuing a more assertive security strategy in its region. The fact that hardly two weeks have passed since Shinzo Abe’s visit to the controversial Yasukuni Shrine on December 26, 2013 adds momentum to these fears. According to the South China Morning Post, which submitted an inquiry on the location of these 280 islands to the secretariat of the Headquarters for Ocean Policy, the islands are located “all around Japan.” The nationalization of islands is not new to Japanese policy; most famously, Prime Minister Yoshihiko Noda’s government nationalized the Senkaku Islands to prevent their purchase by Tokyo Governor and ardent nationalist Shintaro Ishihara. Yamamoto noted that Japan had nationalized 99 remote islands, all within its exclusive economic zone, by August 2011. The move represents an attempt by Japan to establish de jure administrative sovereignty over territory that had previously only been considered Japanese de facto. The nationalization strategy also fits in squarely with Japan’s December 2013 national security strategy which came weeks after China declared an Air Defense Identification Zone (ADIZ) over the East China Sea. Japan’s December 2013 defense guideline stated that Japan will “calmly and resolutely to the rapid expansion and step-up of China’s maritime and air activities.” The move to nationalize these islands could run along these lines. Japan’s new national security strategy says Tokyo will make a “proactive contribution to peace” in the region by taking on a greater burden in the U.S.-Japan alliance, and by enforcing its territorial claims against what it perceives to be Chinese encroachment. Prime Minister Shinzo Abe has demonstrated an intent to push Japan’s self-defense to its constitutional limits. Article 9 of Japan’s constitution restricts the sorts of activities its armed forces can engage in, along with the kind of military hardware it can acquire. A cornerstone of this new national security strategy is island defense and establishing de jure administrative control over these islands is Japan’s way of ensuring that its territorial integrity is unambiguously preserved. Japan’s defense ministry took steps earlier this year to establish a Japanese analogue to the U.S. Marines, a highly deployable fighting force fit for amphibious assault and island defense.